I always try and recycle as much as I can – including food tins which can be made into several different crafts. 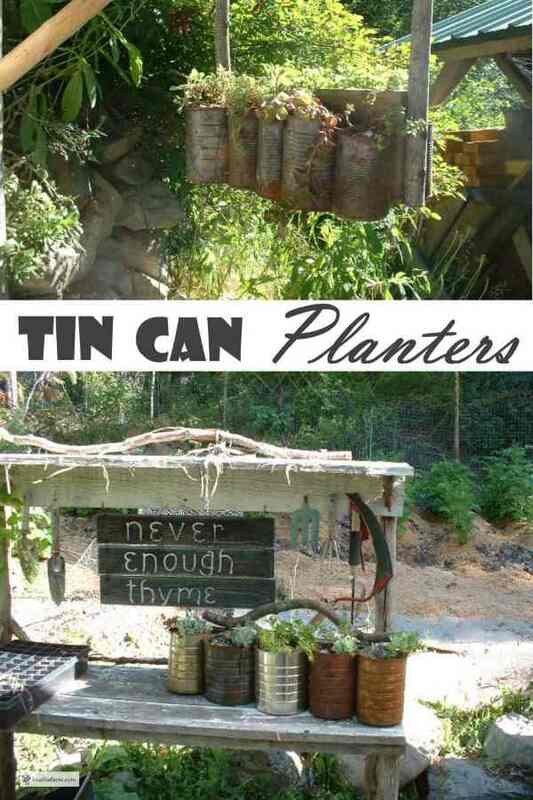 Tin can planters are an interesting and unique way to use a common recycling item. Tin cans have been around for centuries for storing food in a safe and economical way. They’ve remained mostly unchanged in form and function over the years. This makes for a lot of raw material for crafts - wash and save your tin cans, for future projects like this. 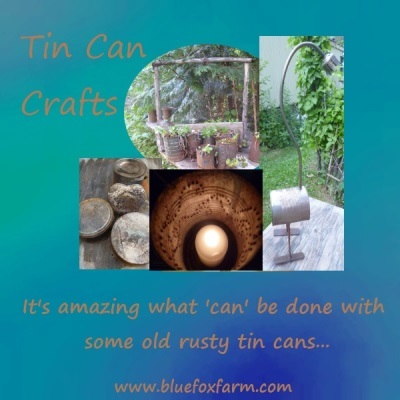 Other crafts that I use tin cans for are punched tin lamp shades and tin can lanterns. The tins can be aged by burning the factory finish or any paint off them first, then allowed to rust to that great patina. First, use up the contents of the tin can! Rinse out the remains, and then throw the tin can into a fire to burn off the finishes such as paint and labels. Make sure to turn the can over and expose all sides and the insides to the flames. Don’t over do it as you’ll end up with holes in the can. Take the can out and allow it to cool off, rinse the soot off in a bucket of water, or just leave the can out in the rain for a while. To make the can rusty, spray with a diluted mix of bleach and water, rinse off again. See the page on making metal look old for more detailed instructions. For making a tin can planter, you’ll need six to eight cans if they’re small, or three to five if bigger, such as coffee cans – you can use all the same size, or vary it. A wiggly twig handle is essential for a rustic looking tin can planter. One piece of scrap dimension lumber or barnboard, long enough for all the cans to fit along it. Drill a hole in the side near the bottom of each can for a drainage hole. Drilling the hole is neater, but you can hammer a sharp nail in for the same effect. Attach the cans to the upright board with screws. Attach the wiggly twig handle to the top of the board, either with screws or wire, or both. 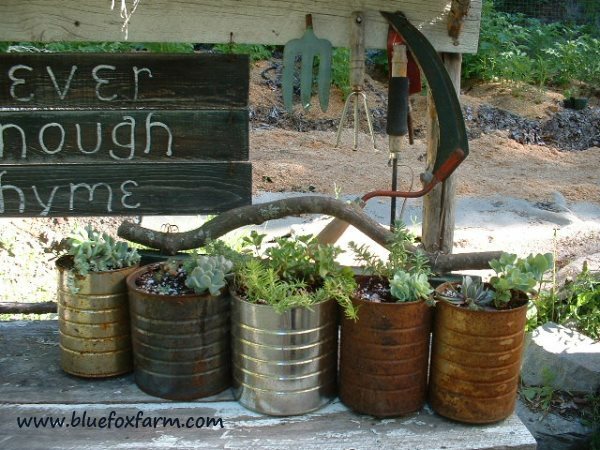 Fill the cans with some potting soil and succulent plants, hang on the wall, fence or even just display it on the top steps of your porch.